morality in destroying God's creation? “These are one of the most floristically diverse forests in all of North America, unrivaled in terms plant species diversity. In these forests you can see probably in an acre 20 to 30 species of trees. These forests are very complex. When you replace that with either a grassland monoculture or tree farm you don’t recreate the kind of conditions that you had originally – you can’t do that. "These forests are old. It took tens of thousand of years to develop. Once this forest is gone it will take another heaven and another earth for it to be replaced. Once it's gone, it's gone forever. Mountaintop removal is a radical form of strip mining used in the Appalachian mountain communities that is just as it sounds – the top of mountains are removed in order to get at the thin horizontal seams of coal that lie beneath. Sometimes several seams of coal may be removed, requiring more of the mountain to be destroyed with each seam. What do you do with the top of a mountain? Historically, this material – called "spoil" or "overburden" by the industry – is pushed over the side of the mountain into the valleys, creating "valley fills." 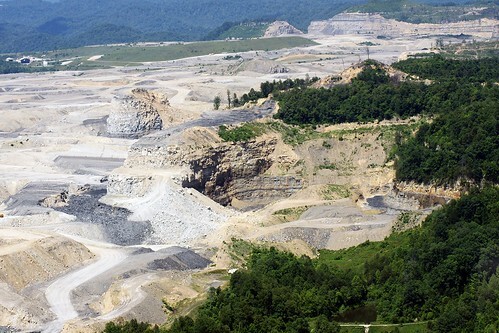 It is not unusual for several miles of valleys and streams to be buried at larger mountaintop removal operations. Mountaintop removal occurs in West Virginia, Kentucky, Virginia and Tennessee. Coal companies in Appalachia have increasingly used this method because it allows for almost complete recovery of thin coal seams while reducing the number of workers required to a fraction of what conventional mining methods need. 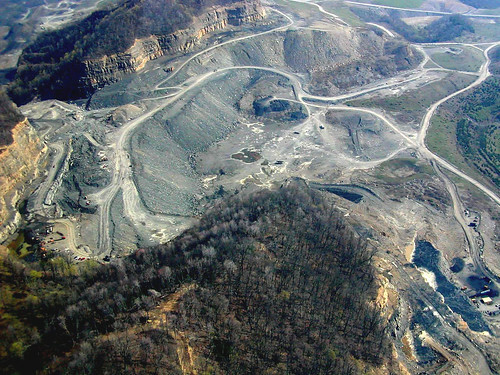 The destruction created by mountaintop removal is extreme and permanent. 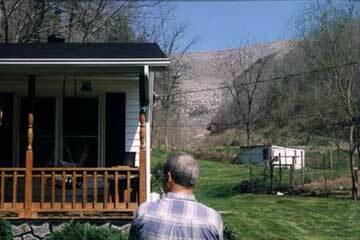 More than 500 Appalachian mountains have been decapitated by mountaintop removal, about 300 of those in eastern Kentucky. A million acres in Kentucky have been affected, and the miles of streams destroyed (buried by valley fills) or severly degraded exceeds 1,400. How is mountaintop removal done? What are the impacts of mountaintop removal?